(Nanowerk Spotlight) The layer-by-layer (LbL) deposition technique for the preparation of protein nanotubes has attracted considerable attention because of their potential nanotechnology applications in enzymatic nanocatalysts, bioseparation nanofilters, and targeting nanocarriers. A drawback is that in template synthesis the extraction process often results in physical deformation of the nanotubes. Researchers in Japan have now developed a new procedure using specific solvent and freeze-drying technique. "In many biomedical applications, protein nanotubes present several advantages over nanospheres" Teruyuki Komatsu tells Nanowerk. "First, nanotubes can possess different interior and exterior surfaces independently. It is therefore possible to construct a one-dimensional space interior for specific reactions and a biocompatible surface exterior that can be tailored to target specific tissues or to respond to particular stimuli. Second, nanotubes have open end terminals, which may be useful for delivery applications. Large quantities of guest molecules can be readily loaded and released without structural change. Third, nanotubes can have long circulation persistence in vivo." Reporting their work in the December 18, 2009 online edition of ACS Nano ("Molecular Capture in Protein Nanotubes"), Komatsu, a professor at the Research Institute for Science & Engineering at Waseda University, together with researcher Xue Qu, describes for the first time molecular capturing properties of protein nanotubes with a controllable affinity and size selectivity. "Human serum albumin (HSA) is the most abundant plasma protein in our blood stream and plays a major role for molecular transport in the body," says Komatsu. 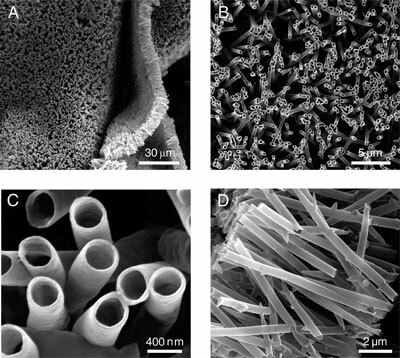 "We generated several HSA-based nanotubes by template synthesis using a nanoporous plastic (polycarbonate) membrane and characterized the molecular capturing capabilities of their cylindrical walls and one-dimensional pore space interiors." Komatsu is confident that the results of this work will lead to the development of a new field of smart protein nanotubes, which can provide not only enhanced biological properties but also electronic, photonic, and/or magnetic performances. "We believe that our nanotubes could have a significant impact on biosupramolecular chemistry, as well as protein nanotechnology" he says. In contrast to previous work ("Protein Nanotubes Comprised of an Alternate Layer-by-Layer Assembly Using a Polycation as an Electrostatic Glue") where large numbers of nanotubes got damaged during the extraction process, the new procedure allows careful extraction of the nanotubes from a porous polycarbonate membrane template using N,N-dimethylformamide (DMF) and rapidly freeze-dried to yield a lyophilized powder that is readily dispersed in aqueous solution. Komatsu notes that, using this method, his team was able to generate several different HSA-based nanotubes and characterize the molecule-capturing capabilities of their cylindrical walls and one-dimensional pore space interiors. "First, we have controlled the molecular capturing property of the protein nanotubes using recombinant HSA mutant, in which the molecular binding ability was enhanced by a genetic engineering technique. Second, we have shown the efficient molecular incorporation of 100-nm particles into the cylindrical pores." The researchers showed that they can confer molecular capturing capabilities on both the cylindrical wall and one-dimensional space interior using ligandprotein interactions. As a result, the recombinant HSA-based nanotubes can capture numerous ligands. "We believe that simply depositing a specific protein at the last layer of the nanotube cylinders would enable us to create desired loading and release systems to be used as separation devices in biomedical fields," says Komatsu. "In some instances, nanotubes having an antibody inner wall might conceivably be exploited as a size-selective trap for infectious viruses." He points out that, currently, recombinant HSA is manufactured on an industrial scale, which makes it possible to use the HSA nanotubes in practical applications. "Furthermore, our procedure is likely to be applicable to preparations of any cylindrical hollow structure composed of various biomolecules. We are now synthesizing new biocylinders composed of many combinations of materials and evaluated their unique properties."